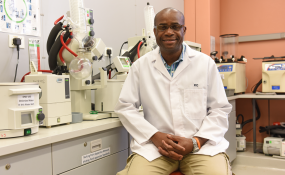 Professor Kelly Chibale, founder and director of Africa's first integrated drug discovery and development centre, H3D at the University of Cape Town. Dar es Salaam — Research has revealed startling findings on malaria. This is to the general effect that the administrative regions in Tanzania which have a higher percentage of children sleeping under insecticide-treated bed-nets still have high malaria prevalence among the children, vis-à-vis regions with low percentage of children sleeping under similarly-treated bed-nets. The Malaria Key Indicators for 2017 released recently by the National Bureau of Statistics show that "a majority of children under-5 in 11 regions aren't sleeping under Insecticide-Treated Nets (ITNs). But that isn't a guarantee they will suffer from malaria." Njombe Region has the lowest number of children sleeping under insecticide-treated bed-nets: 11.6 per cent. Other regions in which use of ITNs is low (with their percentages shown in brackets) are: Singida (31.5 per cent); Songwe (33 per cent); Tabora (35.7 per cent); Rukwa (36.3 per cent); Mbeya (37.3 per cent); Katavi (39.6 per cent); Dodoma (42.5 per cent); Shinyanga (43.6 per cent); Manyara (45.5 per cent), and Simiyu (46.6 per cent). The survey also established that some of the regions with high percentages of under-5s who sleep under ITNs - including Kigoma (61.1 per cent); Kagera (56 per cent), and Mtwara (67 per cent) - are leading with high malaria prevalence. This is, indeed, contrary to the common belief that routine use of mosquito bed-nets reduces the spread of the female Anopheles mosquito-transmitted malaria. According to the NBS, the highest malaria prevalence in children under-5 is in Kigoma - with 24.4 per cent rating - Geita (17.3 per cent); Kagera (15.4 per cent); Mtwara (14.8 per cent); Ruvuma (11.8 per cent); Tabora and Lindi (11.7 per cent each), and Mara (11.2 per cent). Surprisingly, in Njombe - where insecticide-treated bed-nets are used at 58.1 per cent - there's zero prevalence of the disease. "This shows that mosquito bed-nets aren't the only solution in addressing malaria in Tanzania," says Dr William Kisinza, director and chief researcher at the Amani Research Centre of the National Institute for Medical Research. Dr Kisinza is of the view that some communities aren't aware of the benefits of mosquito bed-nets - and, as a result, they fall into the 'high prevalence' category of the killer disease. The expert says this usually happens in regions whose residents engage in fishing or small-scale irrigation farming. "In Kigoma and Mtwara, bed-nets are used in fishing," Dr Kisinza says - adding that "there's a need for behavioural change, if the problem is to be effectively addressed." Climate change and geographical locations are among the reasons for the spread of malaria, with experts saying wetlands are likely to attract mosquitos that dry areas. The disconnect between use of mosquito bed-nets and malaria prevalence was confirmed by the deputy Health minister, Dr Faustine Ndugulile. "Using a bed-net doesn't mean one is safe from malaria... There are other approaches which are also effective in getting rid of mosquitoes in homes," he told The Citizen. Dr Ndugulile mentioned the 'other ways' as including spraying insecticides on the interior walls of homes, and otherwise protecting pregnant women from the Anopheles bite. In any case, Dr Ndugulile said, the government is working hard to lower malaria prevalence in all the areas that are at high risk. Malaria is believed "to have wiped out half-of-all-the-people who ever lived, having killed an estimated 50 billion humans down History. It continues to be one of the biggest killers today.